9 PAX gathered for YHC’s first ever Q for the Valley. 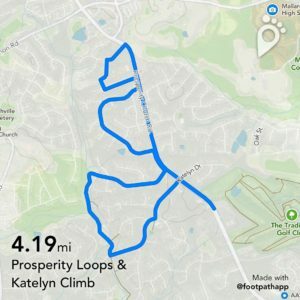 We set out for an approximate 4.2 mile run from the StoneBridge Church Community parking lot, completed a loop at Panthersville Drive, a loop at Old Timber Rd, then took Fairlea Dr to the Clark’s Creek Greenway and finished off with the Katelyn Dr Climb. YHC completely chickened out on attempting to PR the Katelyn Dr Climb, but there is only room for improvement! Overall fast pace for the entire group. Great job gents. F3 can be exactly the type of safety net and support structure that we need. Let’s make a point to dig deeper with our F3 brothers and make sure F3 remains about much more than merely a work out group. Get to know your F3 brothers better so that we might notice changes in one another and be able to lend support when it’s needed. Prayers of encouragement for all. Thanks for letting me Q! I really enjoy running with this group.